This is a plugin for Prestools Suite, the free mass editing script for Prestashop 1.5 and higher and Thirty Bees. You can try out mass special prices editing in the free version - where only saving has been disabled. Special prices were previously called discounts in Prestashop and that name is still common as it is their main purpose. In Prestools the name Discounts is used too because it is shorter. If you select the discounts field in the search block of Prestools and press submit you will see the discounts as an array with numbers. Discounts have a lot of fields and they can be a bit overwhelming in the beginning. However, there is some logic created by the number with the colored background. Most of the numbers and empty fields before this field are qualifiers like the country where the discount applies. The last one before is the "from" price. The colored number itself is the minimum number of products that you need to buy before the discount applies. Next follows the discount (here: 8.2501). Then follows a flag whether this discount includes tax (older versions miss this option). 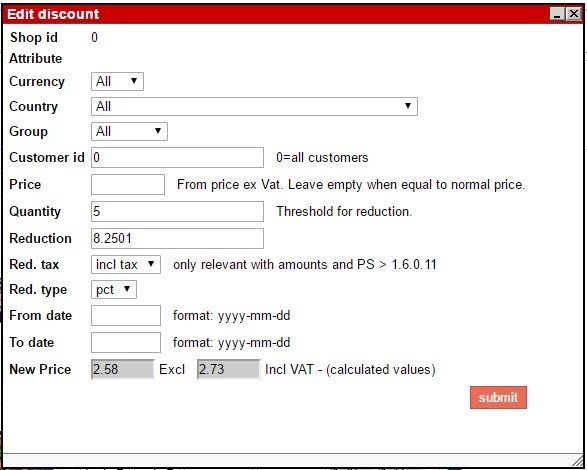 And then follows either "pct" or "amt", indicating that the number of the discount is either a percentage or an amount. At the end of the line you see 2.58/2.73. This indicates the product price after application of the discount. A product can have more than one discount so you will always see the "add a discount rule" at the bottom. The first two fields (shop id and product attribute id) can not be edited here. They can only be set with new discounts. You don't need to remember the function of all the other fields: if you move your mouse over them you will see the field name. The prices with discount at the end are calculated prices - for that reason they have a color background. However, you can change them. In that case the discount will be recalculated - respecting the from price, the tax inc/excl option and the pct/amt option. But you don't need to accept this ugly interface. If you click on the pencil before the middle row you will get a popup where every field is properly named. When you finish this screen by pressing submit you will return to the previous screen with the changed values inserted. In Mass Update you have three options: add a discount, remove a discount and add a fix target discount. In the first case you will get the complete set of fields to fill. For removal you are asked to select one field and then to select a value. So you can remove al discounts where the reduction type is amount. A fixed target discount has a fixed final price. So if you set a target of 4 a product with a price of 5 will get a discount of 1 and a product with a price of 7 will get a discount of 3. Just like in the rest of Prestools nothing is implemented in the database until you press the Submit Al or the line submit button.